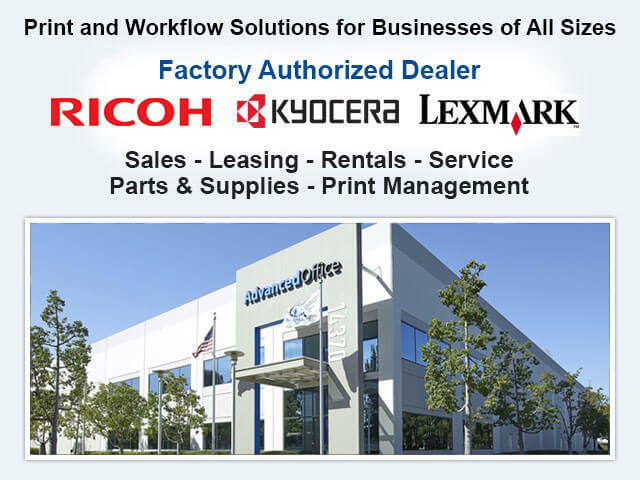 Advanced Office is Escondido's premier Ricoh and Lexmark dealer. For over 30 years we've sold, leased, and rented Ricoh's and Lexmark's complete line of printers, copiers, digital duplicators, wide-format printers, production printers, and fax machines at highly competitive prices. 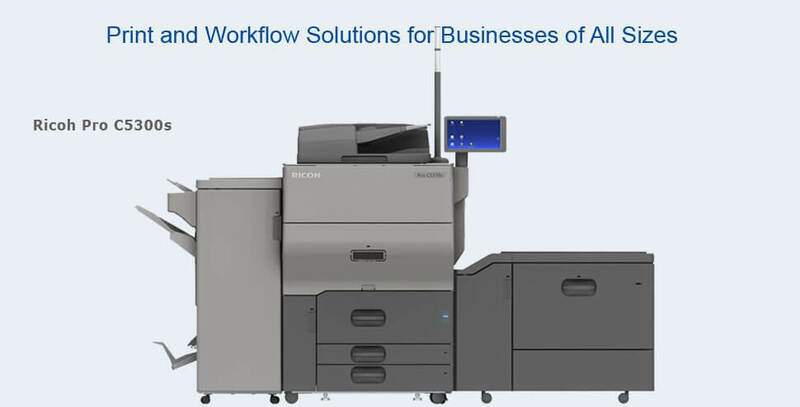 As full-service printer and copier experts, we also offer our Escondido clients comprehensive workflow solutions, custom-designed software, and all-inclusive service and supply agreements. With four offices located throughout Southern California and a local dispatch, we have built a loyal following of more than 30,000 business clients. At Advanced Office, we excel at providing value-added service. We know our Escondido clients by name, specialize in first-call effectiveness, incentive our team to achieve perfect scores on their certification tests, and continue to look for opportunities to improve our service. Everyone on our team is highly trained in Ricoh and Lexmark products, and all of our service technicians are fully certified. Our staff averages more than 13 years of industry experience and excels at providing custom print and workflow solutions. When you connect with anyone on our team, you can immediately tell that you are speaking with someone who is knowledgeable and invested in your satisfaction. We've helped Escondido businesses of all sizes, from nearly every industry: law firms, not-for-profits, schools, doctor offices, hospitals, insurance agencies, mortgage firms, banks, and more. 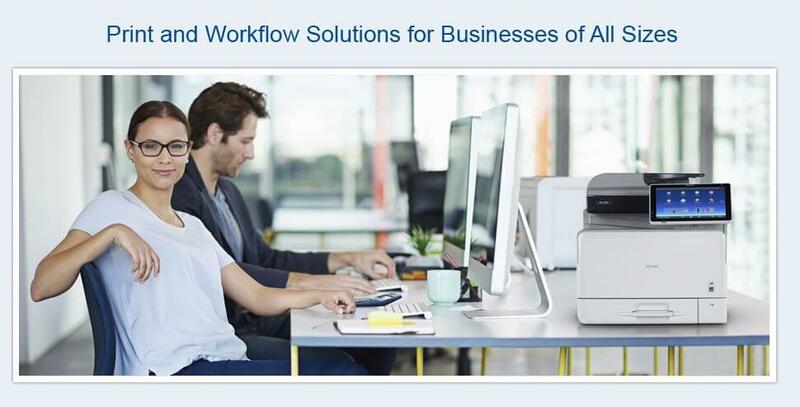 If a business generates at least 1,000 prints per month, our consultants can provide a print and workflow solution to improve your business's productivity and reduce your print-related costs. Call today to speak with one of our sales consultants and to schedule your free on-site analysis. A listing among "Global 100 Most Sustainable Corporations"
Inclusion on the list of the "World's Most Ethical Companies"
With accolades like these and a focused commitment to creating high-performance office automation products with standard and advanced security features, it should comes as no surprise that Ricoh is currently the #1 U.S. market shareholder. Advanced Office is a leading authorized Ricoh dealer for the Escondido area. 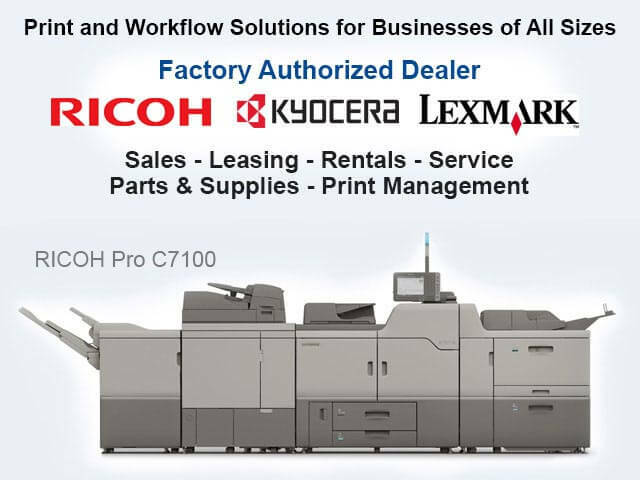 We are fully authorized to sell, lease, and rent printers, multifunction copiers, production printers, wide-format printers, digital duplicators, and fax machines made by Ricoh, as well as Savin, Gestetner, and Lanier. We also provide reliable service and repairs. Our level of customer service is on par with Ricoh's exceptional quality, which we believe is the reason we have become the leading Ricoh dealer in the Western Region and the 12th ranked Ricoh dealer in the U.S. At Advanced Office, we help our Escondido clients find the right Ricoh product for their needs and budget. To learn about all of Ricoh's products, call and speak with one of our product specialists today. Advanced Office is an Authorized Lexmark Business Solutions Dealer, Lexmark's highest level of dealership. As a Business Solution Dealer, we can provide Escondido businesses with the best rates for Lexmark multifunction devices/copiers and printers. Through us, our clients can also gain access to exclusive product lines and software. Like Ricoh, Lexmark is another industry leader among copier and printer manufacturers. Lexmark specializes in offering unparalleled speed for the price and footprint of their equipment. Additionally, all of their equipment is designed and engineered in the U.S. and automatically built with eco-friendly green modes, intuitive application-based interfaces, and comprehensive security features. They also have focused their efforts on developing industry-specific solutions, which have helped them become the preferred choice for 75% of the world's top banks, retailers, and pharmacies. When Escondido businesses need a high-quality printer or copier for a relatively short term, they call Advanced Office. We offer affordable rental agreements for Ricoh and Lexmark machines. Rental terms range from one day to two years. Our copier/printer rentals are perfect for small or new businesses as well as architects, construction companies, and other businesses that need a printer or copier in a remote office for a short period of time. Call us today to speak with one of our sales consultants. For over 30 years, Advanced Office has provided 100% lease financing for printers, multifunction copiers, digital duplicators, wide-format printers, production printers, and fax machines. For many of Advanced Office's clients in Escondido, leasing a printer or copier is the most cost-effective option for their workforce and printing needs. Our lease options feature low interest rates and very affordable monthly payments, which make it possible for Escondido businesses to gain access to Ricoh and Lexmark's high-quality machines for just a fraction of the sale price. We offer $1 buyout leases as well as fair market value leases, both of which are generally arranged for three-year, four-year, or five-year terms. Our leases can also include custom software and a service contract. Call us now to schedule a free workflow analysis. We have product consultants as well as in-house lease advisors to answer all your questions. 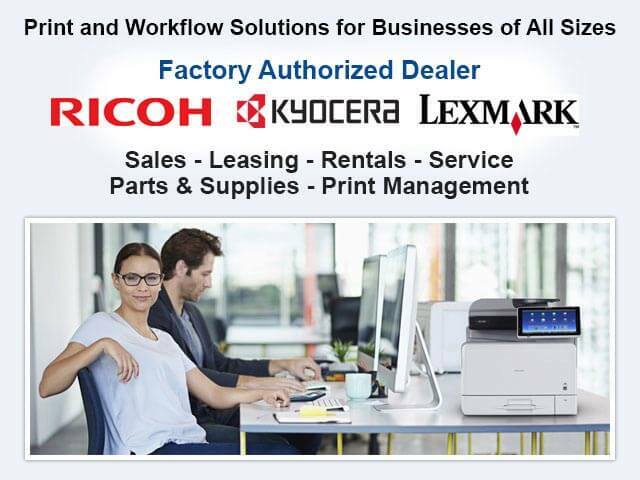 Advanced Office is authorized to sell and install Ricoh and Lexmark printers, multifunction copier systems, production printers, digital duplicators, wide-format systems, and fax machines. By providing these high-performance office automation machines at competitive prices with exceptional customer service, Escondido businesses know that they receive unbeatable value when they purchase their equipment from Advanced Office. We sell both new and refurbished equipment and also offer comprehensive service plans. If you are in the market for a copier or printer, call and speak with one of our sales consultants. They average 15 years of experience and understand how critical a printer or copier can be to a business's bottom line. They'll provide you with honest advice and help you determine the best brand and model for your budget, needs, and level of usage. Plus, we can have your machine delivered, installed and connected to your network faster than any of our competitors--often in less than a week. Call now for a free analysis and customized workflow solution. Our consultants can walk you through the benefits of each of the above. For the vast majority of our clients, our all-inclusive service and supply agreement offers the best value because it is cost-effective and includes free training, all parts and labor, all toner and supplies (everything but the paper and staples), help desk assistance, and more. Many also find that they can become more productive by investing in custom software. Our software can provide innovative solutions to a variety of challenges, such as billing, scanning, electronic content management, security, desktop management, printing, and more. Call us today to learn more. About the helpdesk: "Needless to say my problem was solved and it was a pleasant experience. In a very calm manor he walked me through what I needed to do and what he could do to fix the problem . . .